Dear Mom, I was going to write last night but guess I wasn’t in the right mood. It was one of those nights with a full moon and everything quiet for a change. Felt like going out and walking, I don’t know where, but just go and go. It made me think of old Boots and Trix—how they used to sit out and bark at the moon, so lonesome like. Well, it’s a wonder I didn’t take a couple of barks at it. Ha. All joking aside, I was terribly homesick just sitting out thinking about dear, old home. Gee, but I can’t wait to get back to you all. It just wouldn’t seem possible and yet I know one of these times it will happen—when, I don’t know, but all I can do is hope and pray. (Bert Rokey, writing from Hollandia, New Guinea, in 1944, after his first exposure to combat)Of the 16 million Americans who fought in WWII, over 600 die every day. The Dept. of Veterans Affairs calculates that, by 2022, barely 100,000 will remain, and 10 years after that only a handful of centenarians will be around to tell the story. BARK AT THE MOON is one of the last firsthand accounts you will ever read about the largest conflict the world has ever known.Bert Rokey, Pfc., fought with the U.S. Army’s 34th Infantry Regiment, 24th Infantry Division, primarily in New Guinea, Leyte, and Mindanao. He helped General MacArthur retake the Philippines.Judged by volume alone, this collection of 275 letters would be quite remarkable. 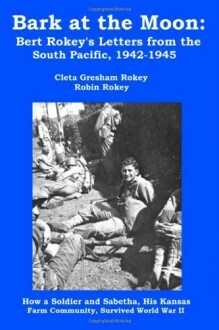 But the intermixture of excerpts from Mary Gresham’s farm journal, which she kept faithfully throughout the war, surely makes it a unique document in the archives of WWII history. Together, these exclusive sources show how soldiers coped with the war’s wretchedness and how their communities struggled on the home front.From Mary Gresham’s journal:Dec. 7, 1941: Cleta and I went to church, ate with Aunt Coda, then went to Lukert’s. Everyone was talking about the U.S. having been attacked by Japan at both Hawaii and the Philippine Islands. In a few hours, Japan declared war against the United States. Great damage was done to our Navy and Navy bases by these surprise attacks. Large number of lives lost at Pearl Harbor and Manila, capital city of the Philippine Islands.Dec. 8: WAR!! Listened to Pres. Roosevelt’s speech to Congress asking that war be declared against Japan. Congress voted unanimously for war except for one vote, Miss Jeanette Rankin, Rep. Congresswoman from Montana. They did this in a very short time. Miss Rankin was one among few who voted against War against Germany in 1917. I also listened to Churchill’s speech from England in the afternoon.BARK AT THE MOON also includes firsthand accounts from O.G. Mayo, the only one of Bert’s Army buddies still alive when this compilation began. Both served in the 34th Infantry Regiment from basic training in Hawaii through the end of the war. Remarkably, O.G. lived just long enough to tell Bert’s story and his own. He died at age 91, just three days after the last chapter of this book was completed.Bert was 90 when he died. But prior to that, like so many soldiers nearing the end of their lives, he expressed disappointment that his family knew so little about the battles he had fought or where the war had taken him. His post-traumatic stress (a.k.a. PTSD) prevented him from discussing these things, except on very rare occasions. Cleta, his wife, promised she would tell the story for him, beginning with his letters, and Bert seemed satisfied with that. Well aware of her meticulous nature, he never mentioned the subject again.BARK AT THE MOON will intrigue enthusiasts of WWII history as well as students of PTSD. Because Bert’s wife wrote the material supplementing the letters, journal entries, and firsthand accounts, the work also has a romantic subtext, which becomes even more pronounced after war’s end.